Here in the Midwest, we get awfully excited about summer. I'm sure all you Floridians do as well, but let's face it, you didn't just spend the last six months in hats, scarves and boots, so the idea of being able to throw on a swimsuit and go play in the sprinkler probably brings a little more interest to kids up here. Therefore, as much as turning on the hose or splashing in the kiddie pool is entertaining, we also take our fun pretty seriously. After all, it's pretty easy to do when we have over 200 acres of water (and theme park!) adventure right here in Wisconsin Dells at Mt. Olympus Water & Theme Park. No matter the weather, the time of year, nor your taste in water and theme park attractions, Mt. Olympus has indoor and outdoor fun that will leave your family anything but bored in their ancient world-themed lands. Thirty-seven steep and slippery slides, six hair-raising roller coasters, eight curve-hugging go-kart tracks, and a titanic array of attractions of all kinds result in a wet and dry experience that won't soon be forgotten! First, discover the all new Lost City of Atlantis, Mt. Olympus' newest mega outdoor water fortress. 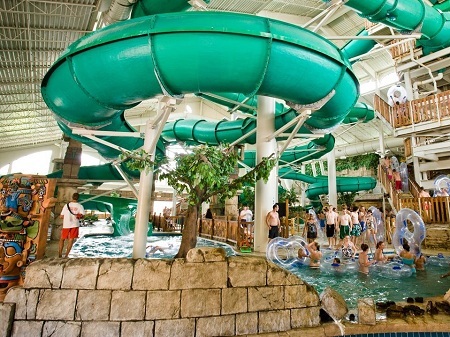 New for 2012, this giant outdoor water fortress is a whopping six stories tall and is tailored for all age groups. Featuring a massive dump bucket and a geyser blasting water over 12 stories into the sky, the water fun only extends from there. 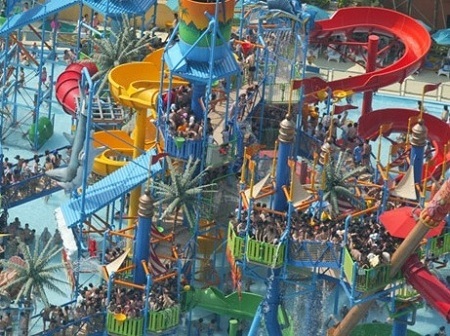 The Lost City of Atlantis boasts a total of seven water slides, consisting of a spinning champagne bowl slide (which propels riders down an enclosed AguaTube into a bowl there they ride centrifugal forces around the bowl), an exciting Boomerango Family Tube slide, a family raft slide and kids' water slides galore! Next, head inside to experience Medusa's Indoor Water Park. Designed to resemble a Mayan Jungle, Medusa's Indoor Water Park contains over 1,500 feet of water slides and a pirate ship in the center of the park with an interactive water play area. Plunge down the 10-story water slide, zoom through the world's fastest lazy river or just sit and relax in the Jaguar Hot Tub. Finally, your whole family is sure to splash, laugh and scream with delight at Neptune's Water Kingdom. An outdoor realm with water slides and rides of all shapes, sizes and speeds, Neptune offers interactive pools for the young and an enchanting Endless River to refresh the weary... as well as Poseidon's Rage, a wave pool whose awesome forces result in the world's tallest waves — over nine feet! Your family can slide down Triton's Fury, surf the gigantic tidal wave pools, or simply sit back, relax and tube down two endless rivers with 360° views of the park. The hardest decision you are going to have to make is deciding where to start... not to mention when to move on to experience Zeus' Playground (roller coasters, go-karts, and more), The Parthenon (an indoor theme park), and much, much more. If you are planning a family vacation this summer, Mt. 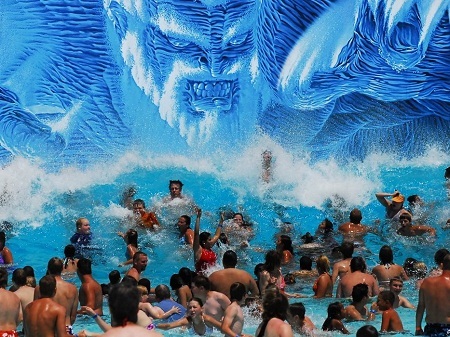 Olympus Water & Theme Park is not to be missed. Ticket prices vary according to the time of year, but right now is best price is FREE thanks to the Fill Up & Splash Down promotion with Mt. Olympus and participating Shell stations. Between June 16th and September 6th, 2012, simply fill up your tank with 10 gallons of fuel from participating Shell stations and you'll receive a FREE all day waterpark ticket to Mt. Olympus! Find all of the details and a list of participating Shell stations on the Fill Up & Splash Down Facebook page and then be ready to enjoy your summer fun with a FREE waterpark ticket! Mt. 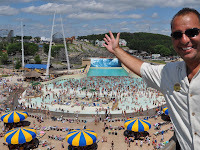 Olympus Waterpark in Wisconsin Dells! This post was brought to you in partnership with the Wisconsin Mom Squad. I was provided waterpark passes to give away and a promotional item to thank me for my participation. I have never been to the Dells or Mt. Olympus, but Ia m a lazy river type of girl while my husband loves the huge drop slides. I haven't been to the Dells in years. I love log rides, this looks fun! I like the toilet bowl ones!! I've never been but I love roller coasters! I have gone a few times and loved it! It is so nice to have both the water park and the amusement park. I absolutely love the indoor water park. We have not been to Mt Olympus but we love all the water slides at Noah's Ark! I have not been there but I love tube family water slides! We have not been to Mt. Olympus but we are only a few hours away and we know many who have. We would enjoy the Endless River! We haven;t been to Wisconsin Dells since I was pregnant for my now 7 year old. He is a water addict and I would love to take him. 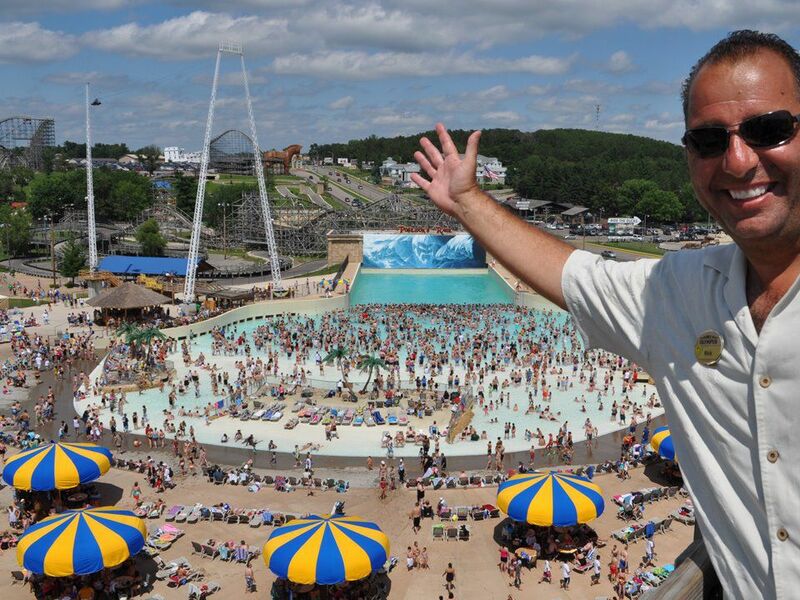 Haven't been there, but the water slides look like a lot of fun. It has been years since I have been to Mt. Olympus! We do go to the dells each winter for a mini vacation tho. 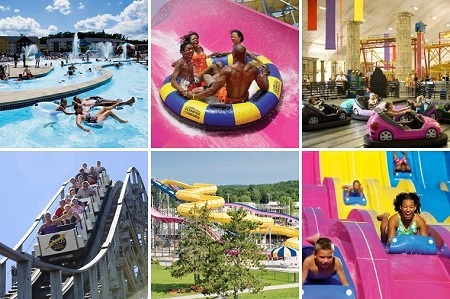 Our favorite place to go is Kalahari and we love all the tube rides! I've never stayed at/been to Mt. Olympus, but they have a really fun looking roller coaster we've always wanted to try. I love flume rides at the water park. I have never been to a water park and haven't experience something like it.but if I had the chance to go, I would like to try the big slides and weather is fun. I'm kind of a whimp, so I like the river troy or the endless river. Just love to float around the park! I'VE NEVER BEEN THERE BUT WE TAKE OUR KIDS EVERY YEAR TO FRANKENMUTH, MI TO ZENDERS AND HAVE A BALL BUT NEXT YEAR WE WANT TO TAKE THEM SOMEWHERE NEW. WE MAY HAVE FOUND THE PERFECT PLACE. I LOVE EVERYTHING FROM THE LAZY RIVER TO THE TWISTY WATER SLIDES. Of all of the places in the Dells, Mt. Olympus is one that I have not been to. We are heading up to the Dells in August - this would be perfect for our family!